Despite the high prevalence of tuberculosis (TB) in developing countries, isolated pancreatic TB is rare and is usually seen in immunocompromised patients. It presents with non-specific signs and symptoms and may mimic malignancy both clinically and radiologically. Cytologic and histologic confirmation is required to establish the definitive diagnosis. We present a case of a 25-year-old male with a pancreatic mass and markedly elevated serum cancer antigen (CA) 19-9 levels raising the suspicion of malignancy but with a histopathologic picture of TB. This case suggests that clinicians should have a heightened suspicion of pancreatic TB when faced with discrete pancreatic lesions even though elevated tumor markers may indicate malignancy. It is important to perform appropriate diagnostic testing and initiate antitubercular therapy early. 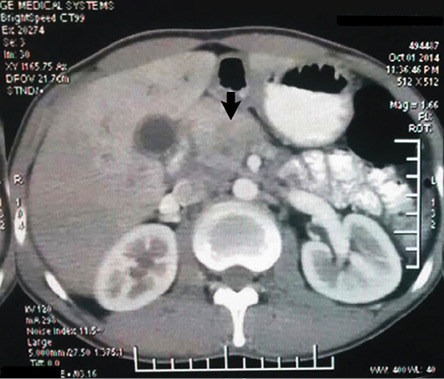 We present a case of pancreatic TB in an immunocompetent patient with marked elevation of serum cancer antigen (CA) 19-9 levels mimicking pancreatic carcinoma clinically and radiologically. Figure 1: Contrast-enhanced computed tomography of the abdomen showing a homogenously enhancing mass lesion in the head of the pancreas. Figure 2: Endoscopic ultrasound with fine needle aspiration showing few atypical cells admixed with benign ductal epithelial cells in a necrotic background. Magnification = 200 ×. A 25-year-old male presented with a history of pain in the upper abdomen unrelated to meals, fever, anorexia, and weight loss. There was no history of pulmonary TB. Physical examination revealed mild epigastric tenderness. No abnormality was detected on routine laboratory investigations. Liver function tests showed: bilirubin 1.04 g/dl, alkaline phosphatase 45 IU/mL (reference range: 30−85 IU/mL), aspartate aminotransferase (AST) 25 IU/L (reference range: 8−46 IU/L), and alanine aminotransferase (ALT) 37 IU/L (reference range: 0−50 IU/L). Hepatitis and HIV serology were negative. CA 19-9 was markedly elevated (18 860 U/mL; reference range = 0−70 U/mL). Abdominal ultrasound revealed a mass lesion in the pancreatic head and contrast-enhanced computed tomography (CECT) showed an ill-defined homogeneous mass lesion with necrosis [Figure 1]. Peripancreatic lymphadenopathy was also noted. No other abnormality was detected. The patient was referred for endo-ultrasonography and fine-needle aspiration cytology (FNAC). An endoscopic ultrasound FNAC from the pancreatic growth showed few atypical cells with large areas of necrosis [Figure 2]. In light of the raised serum CA 19-9 levels and a mass lesion in the pancreatic head on radiological examination, a possibility of adenocarcinoma could not be ruled out on FNAC, and a Whipple procedure (pancreaticoduodenectomy) was performed. Intraoperatively, a 2.5 × 2.5 cm bulky mass was found in the pancreatic head. Figure 3: Whipple procedure specimen showing an ill-defined grey-white area in the head of the pancreas. 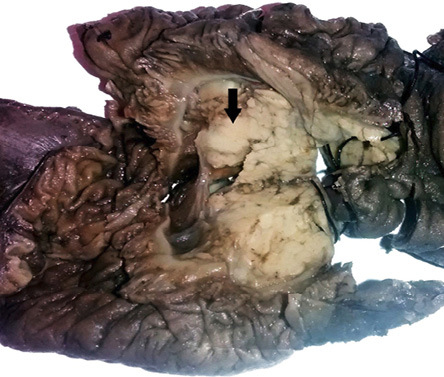 On gross examination, an ill-defined grey-white area measuring 2.5 × 2.5 × 2.0 cm with areas of necrosis was identified in the head of the pancreas [Figure 3]. The rest of the pancreas and duodenal mucosa were unremarkable. 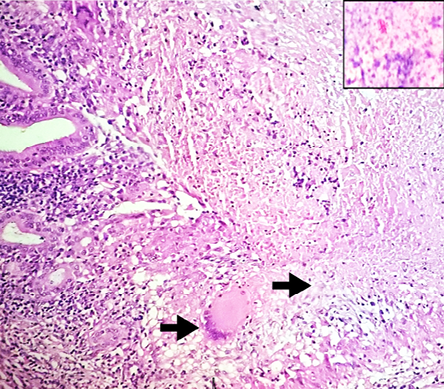 Microscopic examination showed numerous epithelioid cell granulomas with Langhans giant cells and large areas of caseation necrosis in the pancreas. The adjoining pancreatic tissue revealed features of chronic pancreatitis [Figure 4 and 5]. The entire grey-white area in the pancreas was sectioned and examined, revealing a similar picture. No evidence of malignancy was seen in multiple sections examined. Isolated peripancreatic lymph nodes also showed epithelioid cell granulomas with caseous necrosis. Ziehl Neelsen staining revealed the presence of acid-fast bacilli in the necrotic areas [Figure 5, inset]. A final diagnosis of granulomatous inflammation compatible with TB was rendered, and the patient was started on anti-tubercular therapy. 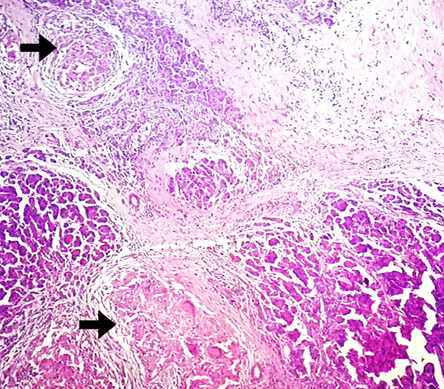 Figure 4: Hematoxylin and eosin staining showing epithelioid cell granulomas in the head of the pancreas. Magnification = 100 ×. Figure 5: Hematoxylin and eosin staining showing epithelioid cell granuloma with extensive central necrosis, magnification = 400 ×. 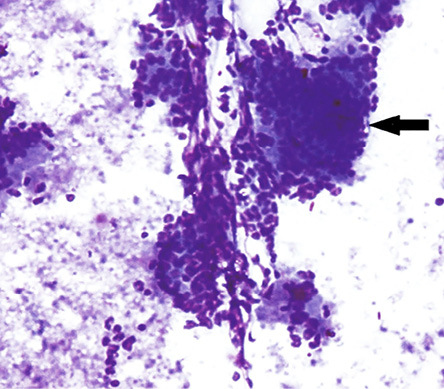 Inset showing acid-fast bacilli (AFB) in necrotic areas (Ziehl Neelsen stain. Magnification = 1000 ×). TB is an infectious disease caused by Mycobacterium tuberculosis. In 2013, an estimated 9.0 million people developed TB, and 1.5 million died from the disease, 360 000 of whom were HIV-positive.1 Extrapulmonary TB (EPTB) accounts for approximately 20% of all TB cases in immunocompetent patients and increases to almost 50% in patients concomitantly infected with HIV.2 The most common site for EPTB is the lymph nodes, and the abdomen is the sixth most common. The infection may occur anywhere in the gastrointestinal tract, the most common site being the ileocecal region. To the best of our knowledge, our paper is the first to describe a patient with pancreatic TB and this extreme elevation of serum CA 19-9 up to levels suggestive of pancreatic adenocarcinoma (> 18000 IU/L) and in whom no malignancy was found. Such high levels of CA 19-9 along with a CT impression of pancreatic mass and suspicious cytology led to the clinical diagnosis of pancreatic adenocarcinoma, which warranted a Whipple procedure. This unusual case emphasizes that TB should be included in the differential diagnosis of pancreatic masses in developing countries. Although serum CA 19-9 is the most sensitive and specific marker currently used in the diagnosis of pancreatic cancer, it may occasionally show markedly elevated values in non-neoplastic diseases such as TB as seen in our case. Appropriate and timely diagnosis along with antitubercular therapy is advised to avoid unnecessary surgical intervention, especially in young patients. 1. Raghawan P, Rajan D. Isolated Pancreatic Tuberculosis mimicking malignancy in an immunocompetent host. Case Rep Med. 2012;2012:501246. 2. Sharma SK, Mohan A. Extrapulmonary tuberculosis. Indian J Med Res 2004 Oct;120(4):316-353. 3. Bhansali SK. Abdominal tuberculosis. Experiences with 300 cases. Am J Gastroenterol 1977 Apr;67(4):324-337. 4. Singh DK, Haider A, Tatke M, Kumar P, Mishra PK. Primary pancreatic tuberculosis masquerading as a pancreatic tumor leading to Whipple’s pancreaticoduodenectomy. A case report and review of the literature. JOP 2009;10(4):451-456. 5. Franco-Paredes C, Leonard M, Jurado R, Blumberg HM, Smith RM. Tuberculosis of the pancreas: report of two cases and review of the literature. Am J Med Sci 2002 Jan;323(1):54-58. 6. Chen CH, Yang CC, Yeh YH, Yang JC, Chou DA. Pancreatic tuberculosis with obstructive jaundice–a case report. Am J Gastroenterol 1999 Sep;94(9):2534-2536. 7. De Backer AI, Mortelé KJ, Bomans P, De Keulenaer BL, Vanschoubroeck IJ, Kockx MM. Tuberculosis of the pancreas: MRI features. AJR Am J Roentgenol 2005 Jan;184(1):50-54. 8. Cho SB. Pancreatic tuberculosis presenting with pancreatic cystic tumor: a case report and review of the literature. Korean J Gastroenterol 2009 May;53(5):324-328. 9. Tauro LF, Martis JS, George C, Kamath A, Lobo G, Hegde BR. Tuberculous mastitis presenting as breast abscess. Oman Med J 2011 Jan;26(1):53-55. 10. Steinberg W. The clinical utility of the CA 19-9 tumor-associated antigen. Am J Gastroenterol 1990 Apr;85(4):350-355. 11. van der Veek PP, de Vos Tot Nederveen Cappel WH, Langers AM, van Hoek B. Two Patients with Extremely Elevated Tumor Markers: Where Is the Malignancy? Gastroenterol Res Pract. 2011;2011:123743.